It's been on TV, in malls nationwide, and on The Outdoor Channel! 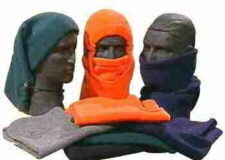 Be prepared for winter sports and activities with the Polar Hood. The Polar Hood is made of Poly-Fleece, which is two times warmer than wool, water resistant, and rated to 20 degrees below zero (Fahrenheit). If you like the winter outdoors, you need the protection of The Polar Hood. If you know someone who shares your passion for the winter outdoors, The Polar Hood makes a great gift!